Once owned by the Peabody Trust, this wedge-shaped conservation area lies between Queenstown Road and Wandsworth Road (the A3036), with a natural border to the north created by railway tracks linking Queenstown Road and Wandsworth Road stations. Here you’ll find rows of neat, terraced houses and maisonettes on tree-lined streets together with a small, local park. 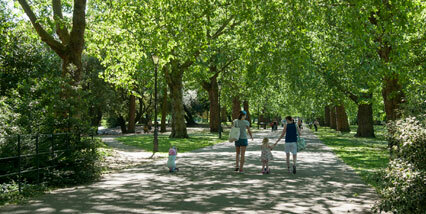 The great facilities of Battersea Park are also within easy reach. The Diamond Conservation Area is just a few streets away from Battersea Power Station, where an ambitious redevelopment of this huge site will include a new tube station plus restaurants, cinemas, theatres, conference centres, shops and hotels. This massive project is predicted to turn this part of Battersea into one of London’s most sought-after residential areas. You’ll come across small shopping precincts and convenience stores on Queenstown Road and Wandsworth Road but most Battersea residents head for the district around Clapham Junction, Lavender Hill and Northcote Road for serious shopping. Restaurants in the Diamond Conservation Area include the highly rated Santa Maria del Sur, an Argentine restaurant serving grilled steaks and cocktails, and Dalila, which specialises in Middle Eastern cuisine. Heathbrook Park is an open green area with a small children’s play area close to Wandsworth Road station, while the 83 hectare Battersea Park, with its sporting facilities, boating lake, art gallery and children’s zoo, is just a few streets away. The park hosts annual events such as food festivals and the popular ‘Affordable Art Show’. Trains from Queenstown Road station travel into Waterloo via Richmond, Hounslow and Staines, while Wandsworth Road trains follow a route to Highbury and Islington via Canada Water and Rotherhithe. Alternatively it’s just one stop from Wandsworth Road to Clapham Junction, with its many connections for central London and the west, plus a direct service to Gatwick Airport. Local bus services include the 77, 87, 137, 156, 345, 452, N87 and N137. Primary schools in the area include the state run John Burns Primary and Shaftesbury Park Primary or there’s the popular independent L’Ecole Du Parc. All three schools have been rated ‘Good’ by Ofsted, while Heathbrook Primary School and Wix Primary School are considered to ‘Require improvement’. Popular private schools Newton Preparatory School and Eaton House the Manor School take children of both sexes, from nursery to 13 years. Secondary schools include the Lambeth Academy (rated ‘Good’) and the recently opened Harris Academy: both are non-fee paying schools. The Dominie School (a popular independent) is also rated ‘Good’ by Ofsted. Winchester White is happy to advise on properties available to rent in the Diamond Conservation area. This attractive community is convenient for railway stations and the park and will soon share the great retail and leisure facilities planned as part of Battersea Power Station’s redevelopment.